ONLY 6 BOOTHS REMAINING as of April 23! Our 2019 Cochrane Trade Show will take place on Saturday May 4 and Sunday May 5. Early Bird Cochrane Chamber Member registration will open on October 17, 2018. Our 2018 show was another sell-out. Our last Trade Show was another sell-out and we expect no less for 2019. The show will take place on Saturday, May 4th and Sunday, May 5th 2019 at the Spray Lake Sawmills Family Sports Centre. Check back often for updates on what you will see at this year’s show! As a consumer show, the event has over 140 local exhibits ranging from home based businesses to products and services offered at retail stores. The show has attractions for all ages, and many interactive displays, as well as family entertainment. Public admission grows each year with expectations of 2800 to 3000+ people visiting the show. We even hold a Silent Auction which is another great way to showcase your business' products or services. No matter what aspect of the show you participate in, it is sure to be a great experience for everyone! The Cochrane & District Chamber of Commerce (CDCC) is seeking another outstanding Trade Show for 2019. We continue to develop, improve, and grow the show based on suggestions and comments received from past years. Our little Trade Show isn't so little anymore! Below is the basic information, but please have a look at our Exhibitor Manual for the full scoop! For a snapshot of our Marked up Floorplan as of April 22 2019 (subject to change), please click on the link. 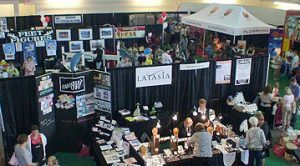 To view a 2019 Vendor/Registrant Listing for the 2019 show, click here (as of April 12, 2019 and subject to change). (2019's list will be posted closer to the show), click here. If interested in donating a door prize or coupons, please contact the Chamber at c.business@cochranechamber.ca or call (403) 932-0320. Donating a product or service from your business is another great way to market your business! For 2019's show, we will once again use the new curling rink and the Totem 1 Hockey Arena. Registration is now open for Members! From Oct 17th to Jan 20th, early bird pricing is being awarded to members of the Cochrane & District Chamber of Commerce. Members do receive a reduced registration rate compared to nonmembers throughout the entire registration period. Nonmember registration opens on Dec 17th. Please see the below charts for further booth price scheduling (prices are all pre-GST). Note that it is to your advantage to register as soon as possible as pricing does increase closer to Show. Must be a current Cochrane and District Chamber of Commerce member. A Chamber membership can be purchased starting at $140+gst to qualify for member rates - to be paid prior to registration. The aforementioned booths come with 750-watt power drop. All booths include drape, 6 ft skirted table, 2 chairs, and a wastebasket. All booths are non-refundable after March 15th. Payment to be made at time of registration. Rates include Saturday morning reception, access to Exhibitors Lounge, high speed connection for debit/credit machine. All booths include drape, 6ft skirted table, 2 chairs, and a wastebasket. Booth height is 8 ft backwall and 3 ft sidewall. Must be a current Cochrane and District Chamber of Commerce member to receive the member rate. A Chamber membership can be purchased at $140+gst to qualify for member rates - to be paid prior to registration. Power requested on site will be charged to the Home Based Business at a rate of $105. Booths without power may be placed in the lobby. All booths non-refundable after March 15th. Rates include Saturday morning reception, access to the Exhibitors Lounge, and high speed connection for debit/credit machine. Power requested on site will be charged to the Non-Profit at a rate of $105. As we approach closer to show, a 2019 registrant/booth number listing will also be available for viewing. As the official show management company, GES will be working with you to help make your participation in this show a success! If you need additional equipment, electrical items or have special move in requirements, please refer to the GES Exhibitors Kit . REGISTRATION: Click here to register on-line. To view our EVENTS PAGE for the Cochrane Chamber Trade Show, please click here!